Hospitality is a thriving industry in Savannah, and our culinary training program provides adults with developmental disabilities the skills they need to be successful. Support our kitchen expansion and make space for individuals building career success in the hospitality industry. A local family foundation has issued a challenge grant: Raise $5,000 for our “kitchen expansion” by October 1st to receive $10,000 in grant funding! Lack of space prevents new trainees from joining the program. Every week, a potential trainee is turned away because the crowded kitchen just won’t hold another student. Hospitality is a thriving industry in Savannah, the Hostess City of the South! 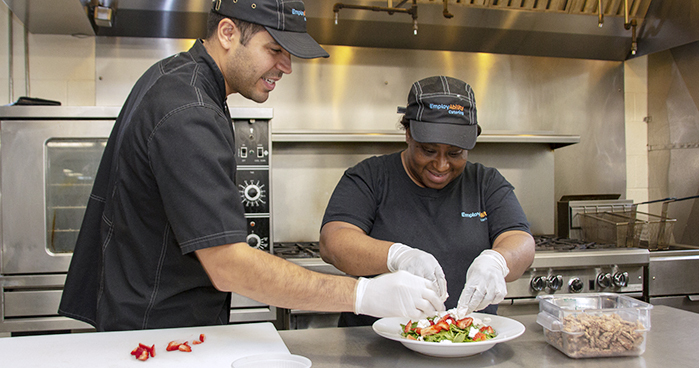 Our culinary training program gives adults with developmental disabilities the skills they need to be successful. Your gift today will help us start Phase 1 of our kitchen expansion project. Every dollar you give will be tripled. No gift is too small, and every donation has the power to make a difference! Are you ready to build a brighter future?